There is nothing better than a sleekly-designed, lightweight, stainless steel applicator when you are spraying confectionery. 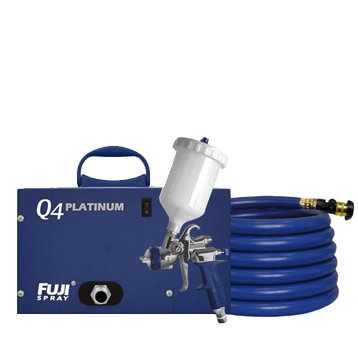 Fuji Spray®‘s Q-PLATINUM™ series are the industry-leading quietest sprayers on the market. Make overspray a thing of the past without sacrificing power or versatility. For confectionery needs, Fuji Spray® recommends a 4 or 5-stage paired with a gravity applicator. This combination offers the flexibility to add larger air cap sizes, making for some awesome effects such as splattering. Use a smaller (3oz) cup for smaller chocolate design projects and airbrush-like effects.